This week at the Digital Library Federation’s 2013 Forum in Austin, Texas the DMPTool team was given the opportunity to present some of the major changes coming in the DMPTool2. Over the next couple of weeks we’ll be posting in-depth feature highlights of how we’re improving the tool and what that will mean for DMP authors, tool administrators, and data support staff. 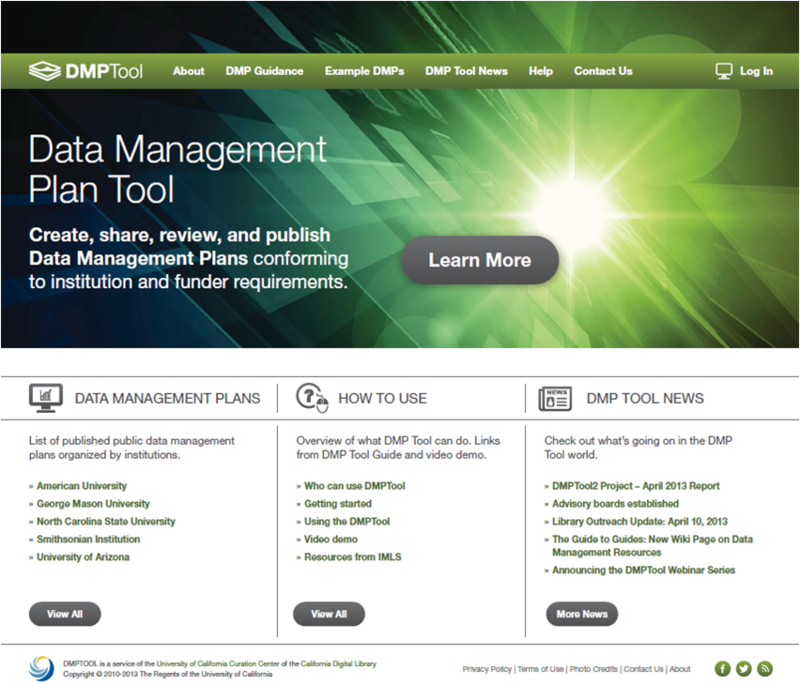 The new DMPTool home page, with updated content. An extremely noticeable change comes in the form of the updated dashboard, with completely new visuals and a more robust way to create DMPs, administer the tool, and find best practices and guidance. In-progress data management plans, institution specific resources, DMPs for review, and useful templates will all be accessible from a single, user homepage. Similarly, creating your data management plan is easier to navigate, with a clear overview of where you are in the process and easy access to examples and prepopulated plans. 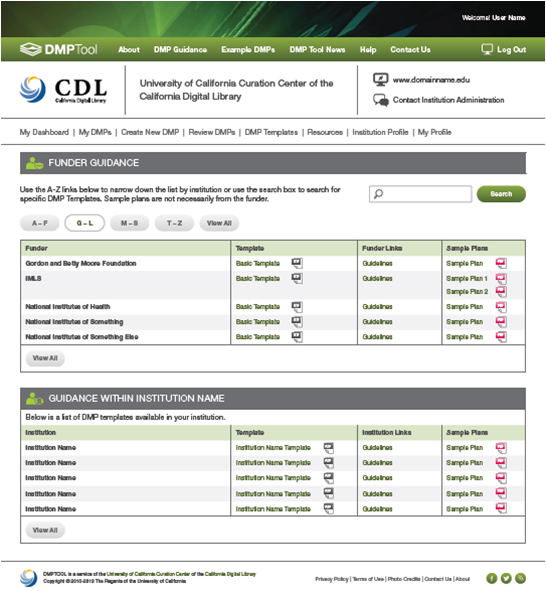 The DMPTool guidance page, with help from funders and your institution. One of the most requested changes to the tool was a way to customize the help text provided from within the user interface. 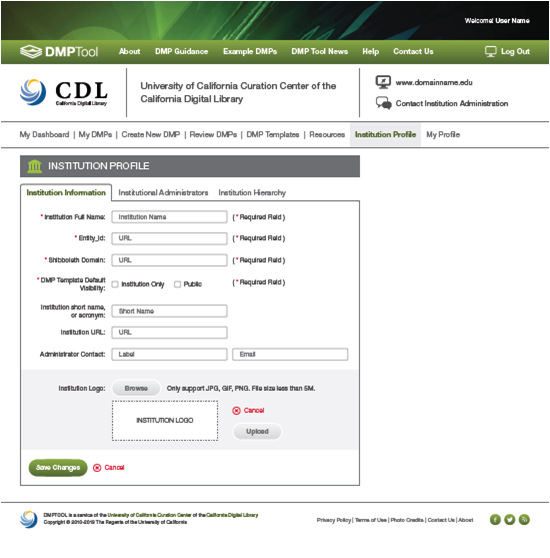 The DMPTool2 dashboard provides administrators with ways to not only customize the help text, links, and contact information but also the templates themselves. Users will have access to a centralized Funder Guidance page complete with links to basic templates, guidelines, and sample plans. These changes will not only improve the tool itself, but also provide an easy way to centralize the information relevant to the researchers who will be using the tool. Making it as easy as possible to not only write a plan, but also find high quality information and resources is a central goal of this project. The institution profile page – you can even upload your logo! For administrators, making major and incremental changes to the institution specific information your researchers can access will be possible directly through the interface. Administrators will be able to customize their institution’s information, provide example answers and help text, and link to libguides and other resources at pivotal points in the DMP’s creation. Making this kind of customization faster and easier will allow the specialists that administrate the tool to respond quickly to their users needs and feedback, and use the DMPTool not only as a way to help write data management plans, but also as an information source for anyone at their institution who interacts with the changing world of research grant writing. Next time, we’ll be going over the ways the DMPTool lets you collaborate within your institution and publish your work to create quality data management plans.